Candlemas (Lichtmess in German) is a day with many sayings attached to it. In Bavaria the farming year begins, the Christmas decorations come down, and forecasts for the coming season are made…. 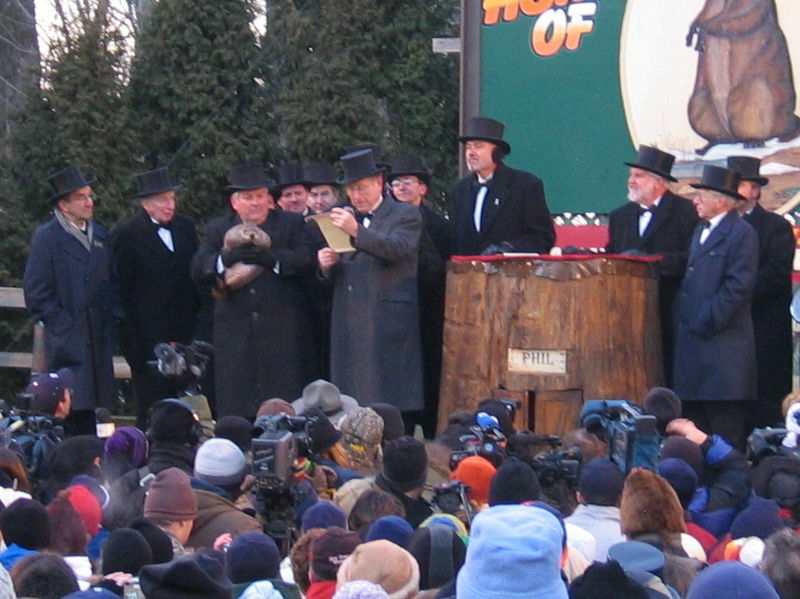 Groundhog Day, famous in Pennsylvania for forecasting the onset of spring, was taken across the Atlantic by German immigrants. Wenn an Lichtmess der Dachs seinen Schatten sieht, geht er noch einmal für sechs Wochen in seinen Bau. If the badger sees his shadow on Candlemas Day, he will return to his burrow for another six weeks. I somehow think Phil would not see his shadow here today… our snow melted within 24 hours on Wednesday, and since then we’ve had cloud, strong winds and rain. So hopefully “winter is gone and will not come again”! What’s the weather like in your part of the world? If the sun is shining, beware – winter may yet return! This entry was posted in Days, Nature, Traditions, Words and tagged Environment, Germany, Nature, Proverbs, Seasons, Spring, Traditions, Wildlife, Winter, Words. Bookmark the permalink. Those proverbs can be full of truth. I didn’t believe that, but last year in Britain the old proverb about St Swithun’s Day proved its worth. It turned out that it’s about the Jet Stream. I wonder which meterological reality the Candlemas proverbs reflect. In actual fact Wikipedia says this particular proverb is only accurate 30-40% of the time! There is no meteorological reality recorded, as this saying came from simple observations in Roman times and was probably perpetuated through superstition! Thanks! I’ve come across that site before – they have loads of interesting facts on seasonal celebrations. Have fun researching… I think there’s a lot of truth in many of these proverbs, even if they aren’t always that accurate! It’s “la chandeleur” over here and we are going to be treated to crepes by friends – we need to take our minds off the dull, rainy weather over here. Well, enjoy the crepes and let’s hope the bad weather bodes well – maybe spring is on the way? I shall read what Phil says in Pennsylvania later today! Still waiting for sunrise, but it looks like a cold, clear morning…followed by more snow tonight. Not sure what’s going on in Pennsylvainia (for Phil) but our RI Rodent will his his shadow, most likely. Hope you can celebrate with your grandson. Sounds like your winter is already coming back! Central Texas is fairly warm, clear days and the nights about 40 degress. Maybe a bit warmer. No rain in sight. A sunny day in central North Carolina, clear blue sky, but cold again 27F (-2.7C). Some folks around here use the wooly worm to forecast winter. Thanks Susie – that’s interesting! Has it been an average winter so far for you, or colder than normal? Wow, you had a lot of snow this year! Stay warm! No matter what we will have 6 more weeks of winter…it’s a given here! That’s a long wait, but winter can be such a lovely season too. Well, as far as I´ve seen, Phil didn´t see his shadow. So spring is coming!!!! It was a cold but beautifully sunny day here today – I was enjoying it, until I read your post! Oh dear… I wonder if you’ll have more snow! It’s forecast for this week! The badger is wiser than we give it credit for! The sunshine has been beautiful today so I won’t rush to change the Winter duvet on the bed yet! I had no idea about the Groundhog Day and German connection. Very interesting! I only found out a few years ago too. Most of the Christian festivals are rooted in pagan ones and surrounded by mystical sayings and predictions too. I bet there are some special ones where you live too! Certainly I’m well aware of Groundhog’s Day, but I never heard about the badger! I’m not that familiar with Candlemas either, so very interesting! Candlemas is the Christian festival of light, where candles are lit in church… with pagan origins! I SEE CRAZY PEOPLE warmer to just write a CHECK! Winter is still hanging around here too – have to be patient for spring! It’s pretty unpredictable at the moment here too!